Evelyn Byrd Harrison was born 5 June 1920 in Charlottesville, Virginia, and graduated from John Marshall High School in Richmond. She was descended from two First Families of Virginia, lineages recognized as belonging among the first wave of English settlers to colonize Jamestown in the 17th century. The Byrds became a lasting and prominent political dynasty in Virginia, as did the Harrisons, who produced Virginia governors and two American presidents. As a southerner, Harrison was proud of her family heritage, which even boasted distant kinship to Pocahontas, but her life and her life’s work was spent in other places. She came north for her education, receiving her A.B. from Barnard College in 1941 and completing her M.A. at Columbia University in 1943. She then had a break in her studies. Like many of her peers, she was enlisted in the war effort, serving as a Research Analytic Specialist until 1945, where she worked on encryption and code breaking. Believing that as a classicist she had superior language skills, the army gave her a crash course in Japanese and then set her to translating intercepted Japanese messages for the War Department. By 1946, she had resumed doctoral studies at Columbia, studying with William Bell Dinsmoor and Margarete Bieber, and in 1949 she joined the staff of the excavations of the Athenian Agora conducted by the American School of Classical Studies at Athens. Her dissertation on the portrait sculpture from the Agora came out of this work. It was revised and published in 1953, the year after she was awarded her Ph.D., under the title Portrait Sculpture.1 It inaugurated the Agora excavation series. In 1965, Harrison contributed Archaic and Archaistic Sculpture to the series. She wrote in its preface, “[t]he Agora sculpture helps us to understand the everyday background from which the great Athenian sculpture sprang and the working of the tradition which kept these inventions alive for the enjoyment of later ages.”2 Exploring this interplay was a hallmark of her scholarly output. Both books, which came early in her career, represented important contributions to the history of Greek sculpture and secured her place in the field. Her superb eye, her analytical intellect, and her gifts as a writer abound in these works. Her teaching career began at the University of Cincinnati in 1951, where in addition to art history she taught first-year Greek and Latin. Between 1953 and 1955, she returned to research at the Agora excavations before joining the faculty of the Department of Art History and Archaeology of Columbia University, where she was named full professor in 1967. Following her time at Columbia, she spent four years at Princeton University; she was the first woman to become full professor in the Department of Art History and Archaeology. In 1974, she joined the faculty of the Institute of Fine Arts, New York University, as Edith Kitzmiller Professor of the History of Fine Arts. She became professor emerita in 1992 but continued teaching at the institute until 2006. Throughout her long career, she spent almost every summer at the American School of Classical Studies at Athens, studying the material from the Agora and elsewhere. This meant that her unusually sharp eyes were continually honed. She possessed an uncommon visual command of Greek sculpture akin to a mental database that allowed her to readily call up images of everything she had ever seen. This visual acuity, along with her deep and broad knowledge of the ancient world, grounded her scholarly pursuits. Above all, her interest was in iconography, in uncovering and understanding the meaning of sculpture, monuments, and architecture, especially within the context of fifth-century Greece, although her publications ranged from the Daedalic period to the age of Constantine. She was a master of using details, often from fragments, to point to a deeper understanding of Greek history, culture, and society. The questions she posed were basic. For example, she wanted to know who was being represented, what story or myth was being told, why it was being told in a certain way at a certain time, and how that ultimately fit into the larger scheme of life during that period. In Athens, she taught generations of students in excavations and museums. No one was more inspiring in front of ancient sculpture. Her research as an art historian always proceeded first from the object. She began by intensely looking at and examining what she was studying and from there proceeded into close analysis. She possessed a phenomenal capacity to analyze style. In particular, her contributions to style analyses of costume, including hair and dress, down to details such as how particular folds draped, played an important role in suggesting dates for sculpture and monuments and placing them into an overall fifth-century chronology, a period in which few securely dated pieces exist. Her years at the Institute of Fine Arts were prolific. She published numerous articles, including an important three-part series “Alkamenes’ Sculptures for the Hephaisteion.”5 These years were also devoted to teaching as well as mentoring her Ph.D. students. She was very discriminating in the doctoral candidates she took on, choosing them not only for their talent but also for the potential she saw in them. Often, she could discern the direction of their interests before they did, and she was extremely skillful in assigning research topics that well suited them. As a mentor, she tended to teach by listening, guiding, and showing, rather than telling. For instance, she might suggest, then demonstrate how a particular fragment fit into a sculpture, something that could be difficult for those in training to see at first. And she was always generous with her time, making herself available to talk through questions and problems. In fact, an afternoon conversation with her could last an hour or much longer and range over the entire ancient world, from sculpture to politics to literature. She was famous for her erudition, which spanned the ancient world. If a point of interest arose that she was not familiar with, her own deep sense of curiosity would propel her to investigate it for herself. Outwardly she possessed a courtly southern manner and always had a ready smile, but immediately underneath this gracious exterior was the force of her fierce intellect. She could be intimidating, yet she was also deeply admired, especially by her students. On a day-to-day basis they witnessed her commitment to teaching and to scholarship. As “Miss Harrison students” they experienced her loyalty in supporting them through their degrees and into the next phases of their careers. She was unfailingly helpful, not only as a teacher but in practical matters, too, such as steering them toward appropriate fellowship opportunities and advocating that they receive fair pay for their work, including student jobs. Her distinction, long recognized by her students and colleagues, was publicly marked by election to the American Philosophical Society, the American Academy of Arts and Sciences, and the Deutsches Archäologisches Institut, and by an honorary degree from the National and Kapodistrian University of Athens. She bore these honors, and others, lightly. 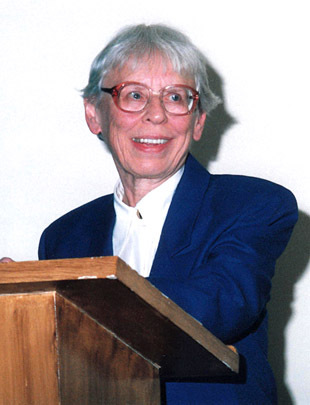 After a long and distinguished career, she was awarded the Archaeological Institute of America’s Gold Medal for Distinguished Archaeological Achievement in 1992. She brought immense gifts to her profession as an art historian that combined with her commitment to scholarship to ensure she played a significant role in shaping the course of classical art history during the second half of the 20th century, one that deepened our understanding of individual works of art and broadened our awareness of their archaeological, cultural, and historical context. Evelyn Byrd Harrison died peacefully at home in New York on 3 November 2012. Gladwell, M. 2005. Blink: The Power of Thinking Without Thinking. New York: Little, Brown and Co.
Harrison, E.B. 1953. Portrait Sculpture. Agora 1. Princeton: American School of Classical Studies at Athens. Harrison, E.B. 1960. Ancient Portraits from the Athenian Agora. AgoraPicBk 5. Princeton: American School of Classical Studies at Athens. Harrison, E.B. 1965. Archaic and Archaistic Sculpture. Agora 11. Princeton: American School of Classical Studies at Athens. Harrison, E.B. 1967. “Athena and Athens in the East Pediment of the Parthenon.” AJA 71(1):27–58. Harrison, E.B. 1977a. “Alkamenes’ Sculptures for the Hephaisteion: Part I, the Cult Statues.” AJA 81(2):137–78. Harrison, E.B. 1977b. “Alkamenes’ Sculptures for the Hephaisteion: Part II, the Base.” AJA 81(3):265–87. Harrison, E.B. 1977c. “Alkamenes’ Sculptures for the Hephaisteion: Part III, Iconography and Style.” AJA 81(4):411–26. 3. Harrison 1960, fig. 23 (caption). 5. Harrison 1977a, 1977b, 1977c.